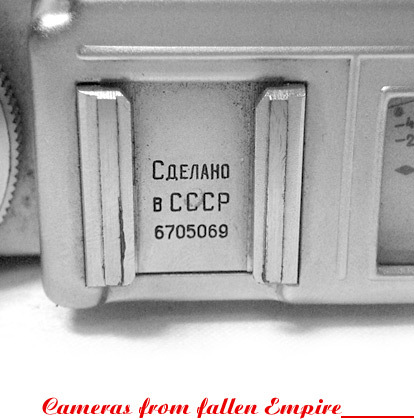 Great page you have, had recently bought a FED-1 camera made in 1941 according to seller, found your site by accident when looking up this camera. Serial: 150889 Managed to find the type (PE0260), thank you for having this site that helped out identifying the camera! You have made a fantastic work of reference. When I was young I used to sell the Zenit camera for a living my experience was they were good workhorses and great value for money. It is a shame that Technical and Optical no longer exist, but thanks for an absorbing and excellent history of the camera. What a fablous work you've done! Many thanks for all your works here, sir :D learned a LOT. Congratulations for your page interesting and enjoyable! I just enrich my modest collection with a Moscow-4 It has been looking for information when I have given their well-documented web! Again, thank you very much! This is a great reference you've built. Thank you for sharing this info with the world. Just picked up a Horizont. Appears to be made in 1970, but not exactly like the one's you've got on the page. Funny how there are so many variations. Excellent research and work, and a fantastic resource. As a historian documenting the history of Russian diving equipment, I know how hard it is to make sense of many discrete data points and then to try to attempt to paint a broad picture by filling in the blanks. On a technical note, in my collection I have a camera not documented here: It is a START SLR from KMZ, but with the same 39mm thread short-mount lenses as was used for the early Zenit cameras. An undocumented find? I will forward photos of it when I am reunited with it (it's in storage now). I appreciate your many hours of researching, and look forward to your new work in the areas that now interest you. Cпасибо очень from the USA! Wonderful website and a fantastic reference aid. I can spend hours looking. Лучший сайт. Ко всему еще и удобно. Спасибо за проделанную работу!!!! Thanks for your very useful website it's a great reference. Correction: My ZK has number 000029. Is this somehow special? I have a ZK with serial number 0000129, dates 1948. Thanks, I have a Lubitel 2 and a Zenit 12, you have a great site here, full of information and nostalgic. Discovering this website today, I was fascinated to see the FED 4L, which I own, though not currently in active use. I had no idea it was named after the founder of the KGB. I would like to see a section in Russian/Soviet telescopes and binoculars, both of which I have owned, and found to be excellent value and quality. Visiting the Ukraine in September 1989 I was surprised to see that none of the Soviet cameras, binoculars, telescopes, monoculars etc that were freely available in Britain were not in sale in the large city of Rovno, now Rivne.